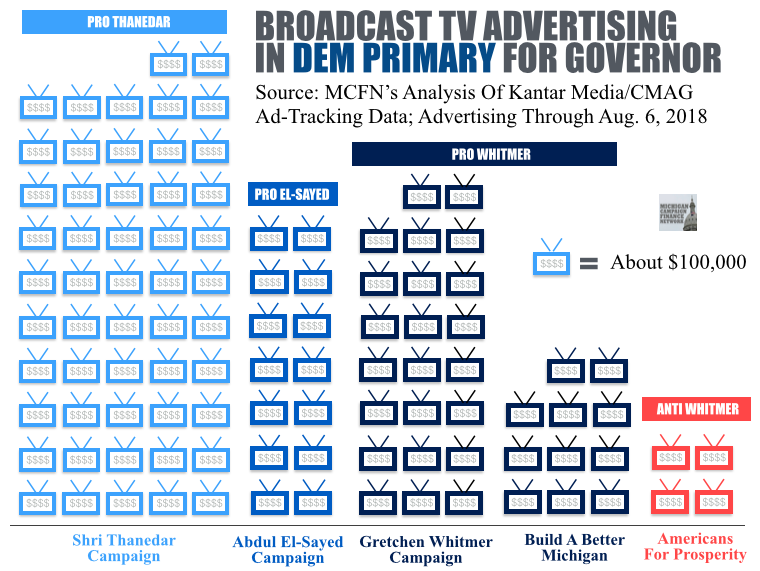 The Wide Majority Of The TV Advertising Focused On The Race To Be Michigan Governor. Nonprofits And Super PACs Have Been Heavily Involved. 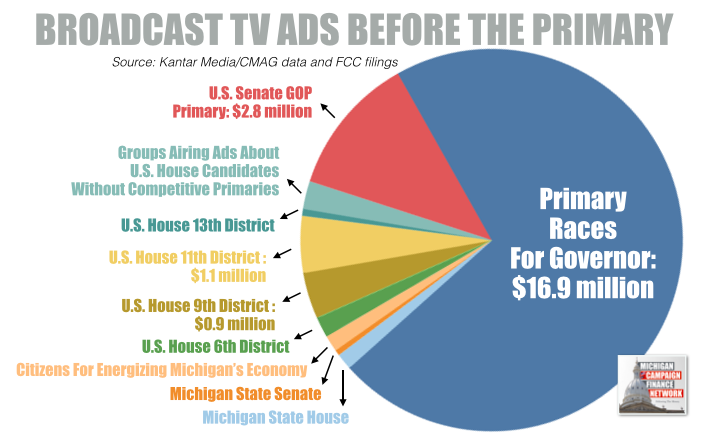 LANSING (AUG. 7, 2018) — About $23.6 million in political advertisements aired on broadcast TV in Michigan before today’s primary election, according to an analysis of ad-tracking data from Kantar Media/CMAG and filings with the Federal Communications Commission. The wide majority of the ads focused on the race for governor, specifically endorsing a candidate, promoting a candidate or criticizing a candidate. Democratic, Libertarian and Republican voters will select nominees today for the general election. An estimated $16.9 million in ads mentioned candidates for governor from the start of 2018 through Monday, Aug. 6, the eve of the primary election. An estimated $3.1 million in broadcast ads focused on primary races for the U.S. House, an estimated $2.8 million focused on the GOP primary race for the U.S. Senate and an estimated $758,000 in broadcast ads focused on races for the state Legislature. Overall, the majority of the spending was done by candidate campaigns. Candidates’ campaigns can’t take money directly from corporations and there are limits on how much donors can give. About $18.0 million in ads came from candidates. About $1.1 million in ads came from political action committees (PACs) or super PACs that can take unlimited contributions and can spend unlimited amounts independently of candidates. PACs also have to file public reports about their donors and their spending. About $4.4 million in ads — about $1.00 in every $5.36 tracked — came from groups that didn’t have to report their donors to the Michigan Secretary of State or the Federal Election Commission. Most of these groups aired ads that didn’t expressly tell people how to vote, so they didn’t fall under Michigan’s campaign finance reporting requirements. 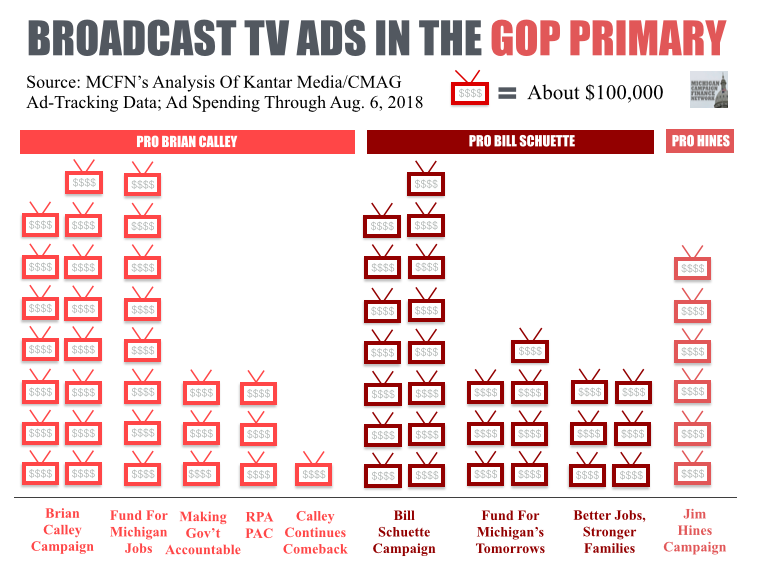 The following is a short summary of the broadcast TV advertising in some of the primary races. Democrat Shri Thanedar’s campaign was easily the biggest spender on TV ads in the primary races. Thanedar’s self-funded campaign shelled out an estimated $5.2 million for broadcast ads, more than double what any other candidate spent. One of Thanedar’s primary opponents, former Senate minority leader Gretchen Whitmer, spent an estimated $2.3 million on broadcast ads. Whitmer also got a boost from a 527 political organization called Build a Better Michigan, which aired $1.1 million in broadcast ads promoting Whitmer. Build a Better Michigan discloses its donors to the Internal Revenue Service but doesn’t have to report its activities under state disclosure requirements. Additionally, the national conservative group Americans for Prosperity, a nonprofit that doesn't have to disclose its donors, aired about $444,000 in broadcast ads opposing Whitmer. The third candidate in the race, Democrat Abdul El-Sayed, had aired about $1.3 million in broadcast ads as of Monday. The two biggest spending Republican candidates for governor spent about the same amount on broadcast ads for the primary. The campaigns of Lt. Gov. Brian Calley and Attorney General Bill Schuette each aired about $1.5 million in broadcast ads. A handful of groups also aired broadcast ads benefiting Calley. The biggest spender was the Fund for Michigan Jobs, which doesn’t have to disclose its donor and aired an estimated $782,000 in ads promoting Calley. Schuette got big help from the nonprofit Fund for Michigan’s Tomorrows and the super PAC Better Jobs, Stronger Families. The Fund for Michigan’s Tomorrows, which doesn’t have to disclose its donors, aired about $654,000 in broadcast ads, and Better Jobs, Stronger Families, aired about $597,000 in broadcast ads. The two other GOP candidates for governor were at a disadvantage when it comes to TV advertising. Jim Hines’ campaign aired about $579,000 in broadcast ads, and MCFN didn’t track any broadcast advertising from state Sen. Patrick Colbeck. Republicans Sandy Pensler and John James are competing for their party’s nomination to take on incumbent U.S. Sen. Debbie Stabenow, a Democrat. Pensler’s campaign, which he heavily self-funded, aired about $1.9 million in broadcast ads. James’ campaign aired about $795,000 in broadcast ads. A PAC supporting James, the Outsider PAC, also ran about $87,000 in ads.